Noise can disrupt the peace in your home. Traffic, neighbours, even the racket your own family makes from talking, watching television or playing music can cause stress and discomfort. Consolidated Energy’s acoustic insulation products will help soundproof your home. The following acoustic batts are designed for residential and commercial buildings to be installed into internal cavity walls during construction. We also have an extensive range of specialist and commercial acoustic products including sound absorbing panels suitable for offices, cafes and restaurants and residential situations where there are a lot of hard surfaces where noise and poor sound quality can be a problem. Information on our acoustic range is below. For further information or advice on a particular application, contact your nearest Consolidated Energy office. Over and above specification, a comfortable habitable living or working area, reducing noise, featuring simple monolithic design or add a vibrant visual statement to your space – ATMF series has it all covered. The Rockfon Facett Brilliant 60mm B edge assembly sits within a suite of assemblies that provides excellent Acoustic, Fire, Thermal and Moisture performance outcomes utilising a direct stick application (Rockfix), whilst providing a clean white finish free of pins & tape. The B edge provides an attractive beveled edge. The ease and flexibility of installation allows for a wide range of applications and for easy adaptation to suit site specific requirements substrates and fixing details. AFTM™ Soffit Series Rockfon Sonar 40mm B Edge. A comprehensive range of aesthetically pleasing durable tiles with a micro-textured surface, strong edges and excellent acoustics, available in a wide variety of sizes and edges which meet the highest fire safety and sound absorption regulations. The Rockfon Sonar range provides extensive design freedom. It is suited for a multitude of spaces such as offices, retail environments, classrooms and cleanrooms. Rockfon Sonar offers the unique combination of the highest fire safety, Fire Class A1, and acoustic comfort, Class A sound absorption, providing peace of mind as well as peace and quiet. 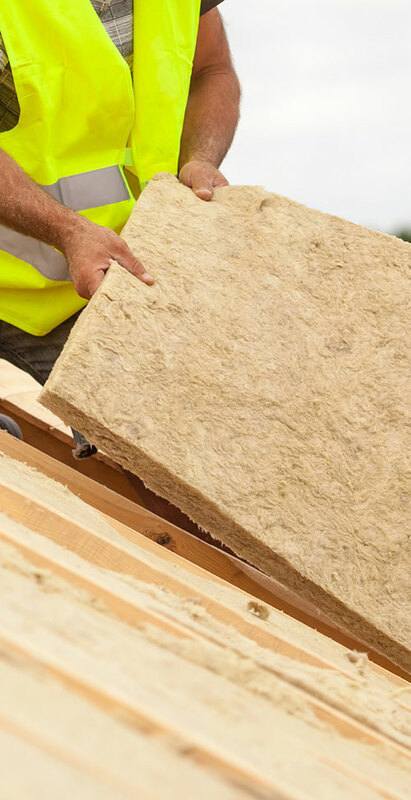 Knauf-Earthwool-SmallThe Earthwool Internal Wall Batt range is a new generation of softer, more environmentally friendly glasswool insulation. Advanced compression packaging reduces handling time and the risk of damage in transit and on-site. This specialist acoustic range of products is available in Standard Performance (11kg/m3) and Ultra Performance (14kg/m3). Earthwool Internal Wall products reduce unwanted noise from outside and also limit sound transmission between adjoining rooms. Polymax Absorb is a thermally bonded polyester fibre insulation that has been specifically designed to provide high-performance acoustic absorption across a broad range of frequencies. Polymax Absorb is made in a range of densities: LD (low density), MD (medium density,) HD (high density) and XHD (extra high density). It is also available in a range of thicknesses, with fibres specifically engineered to provide maximum acoustic performance in many diverse commercial, residential, community and industrial applications. Polymax Absorb is ideal for use behind perforated panelling and ceilings in auditoriums, cinemas, studios and sports halls. It is highly effective at reducing echo in rooms and provides even sound absorption across the speech-range frequencies. Bradford-Soundscreen-SmallSoundScreen acoustic insulation reduces noise transfer by up to 75% to create a quiet and peaceful home. SoundScreen is ideal to install in internal walls or mid floor in double story homes to stop unwanted noise. SoundScreen is a versatile product that makes a great addition to any room in the house, particularly when used around home theatres, bedrooms, ensuites, and laundries.